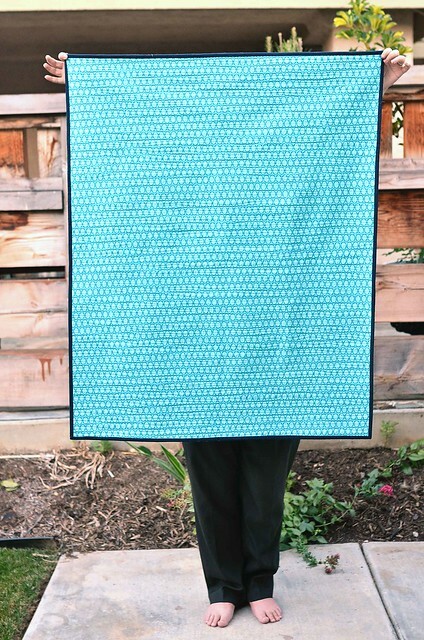 A while back (more than 2 years actually) I took Rachel's Curves class and made this Scallop Quilt. It is still one of my favorite projects and I have wanted to try something similar. But I had no idea how to make templates for my own quilt until I started using EQ7 recently. I knew I wanted to use some of my favorite blue Kona colors, but I mostly had darker blues in stash so I ordered a few lighter options. But then they didn't arrive labeled so I am not sure what the 3rd color from the top is (oops). I think it might be Azure I was wrong, it's Capri! The others are Navy, Celestial, Cyan, Aqua, and Sky. I really need to get a Kona card. I was surprised how quickly the quilt top came together. It has curves, but they are pretty big and wide and not difficult at all. If there is any interest I might post a tutorial next week so let me know. The tutorial is available here. I quilted it with lots of wavy lines. 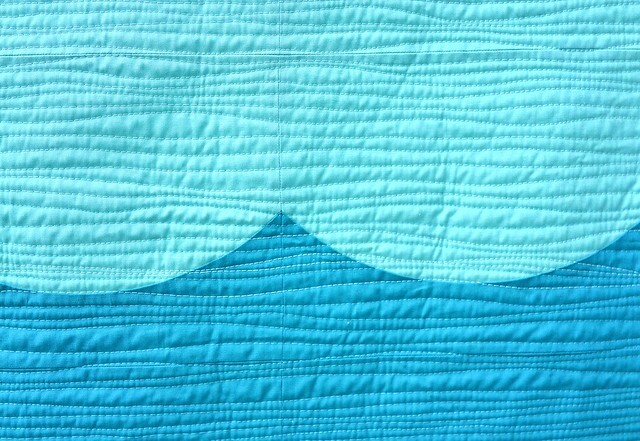 it gave the quilt a nice texture and I liked how it gave it an ocean-y look. Since I posted about baby boy quilts they have been on my mind. So here is another idea to add to my list for baby showers, especially since this one is pretty quick. The backing fabric is an Ann Kelle Remix print. I love the Remix prints. Since I don't have any upcoming baby showers I am adding this one to my shop. You can find it here. I also just wanted to plug Rachel's classes because I loved taking her Curves class so much. She is currently offering an Angled class, which looks so fun. She is great and I highly recommend her classes! what a beautiful and clean design, it's stunning. I'd definitely be interested to read your tutorial! Beautiful quilt!!! I would love a tutorial! Thank you!! I would love to read your tutorial! Such a sweet quilt! I would love a tutorial! Such a pretty quilt! And the quilting looks like currents, and adds such nice texture. This is lovely! I really like what your choice of quilting did for the design! Love it! I'm interested for a tutorial too! I like it - I like how the colors flow, and it looks like it could be beginner friendly intro to curve sewing (maybe? hopefully? - I don't know much about curves) and if so, I'd be interested in a tutorial. Love the look of the waves! So cute! I'd love a tutorial on making my own! I love everything about this quilt! I'm a newbie quilter and have been intimidated by curves, so I would really love a tutorial. Thanks for the inspiration! I love how calming the colours are... and definitely get a colour card, I did and zero regrets LOL! I read with great interest your last post about transitioning from graph paper to EQ7. And then I showed it to my hubby. And then he started looking at EQ7 too! 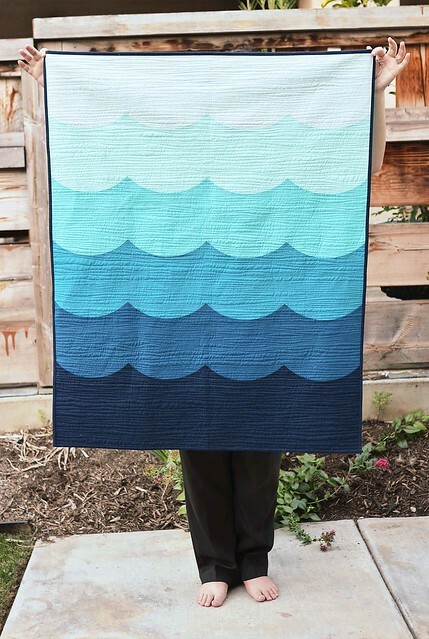 My birthday is coming...: ) I love your Waves quilt And the gentle way you quilted it. Definitely interested in a tutorial! This is a beautiful quilt! Please do write up a tutorial for it!! Love love love. Yes tutorial please! I'm working on something *somewhat* similar actually, haha. I was inspired by your Valentine's improv quilt. Fabulous quilt -I love everything you did with it! I just have to make myself take the plunge and try some curves. BTW, I took Rachel's Color Intensive class this year and it was so much fun. I wonder if she'll offer the curves class again? My husband and I celebrated our 25th anniversary in May. We went to Hawaii and the beach at our hotel had the gradations of color just like yours! Beautiful!!!! Reminds me of the Pacific Ocean. I would love a tutorial too. Thanks! The quilt is adorable. Was Rachel's class an online class? I think I've seen that she does have online classes? I'm always looking for something a little different. Each month this year I've been doing a 5 minute education segment at my guild about something related to quilting. This would be something interesting to introduce to the group. I just joined the programs committee last month due to opening. So, I don't plan to continue with the education segment next year. I need to watch my schedule. I needed to get out of the house and volunteer after I lost my husband a year ago in July and now I'm becoming almost too busy for my health issues. I love the quilt and the quilting on it is great. To practice quilting was one of my goals for the year that has fallen through the cracks. I've had other goals appear automagically on my list though. Thanks for the wonderful post. It's such a beautiful quilt, and I really love the wavy line quilting. I've been looking at EQ7 recently, is it user friendly? I may have to ask Father Christmas for it! Love it. The blues are magnificent and the curves -dreamy! I would be very happy if you would like to share a tutorial. I'd be interested in a tutorial as well. I'd love to know if it was hard to match those curvy points ! It looks hard and you have done a terrific job of matching. The color choices and the quilting all together make it just beautiful ! tutorial? oh yes! I am a bit scared of cutting and sewing those curves through! LOVE! That is modern and cute and so striking! It's really pretty. Love those blues! Your color selection is great. Adding the tutorial to my ever growing project list. Can you provide yardage amounts of each color and the backing?